After three weeks, six illnesses, frequent rain and approximately 45 weather reports from forecaster extraordinaire Jackie Johnson, my parents visit in California has ended. As usual, I learned many things about life during their stay. Unfortunately, a lot of my lessons came through pain - the pain of the XMan. And maybe that's why humans are special. We sacrifice ouvselves for our youth. In week one of the parents visit, everyone in my household got violently ill in what we self-diagnosed as swine flu. That was also the time the XMan gave me a complex morality test and asked me to kill him. In week two, the XMan and my mom went to Tucson, Ariz., where X was attacked by a killer cactus. Apparently, this is no joke. 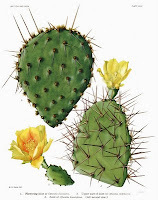 Killer Prickly Pear Cacti exist in Tucson, and the cacti will attack people from many feet away. In week three, rain uncharacteristically pelted the Southland. My parents and I became enthralled by the weather-predicting ways of KCAL-9 weathergal Jackie Johnson, who is on television for three hours per night in Los Angeles. As we played games with my daughters and had fun despite the rain, we stayed relatively out of pain and trouble - until the last night. The XMan, nursing a self-diagnosed torn rotator cuff and broken back, slipped out of his chair during a Scrabble game. He had not been drinking at all and claimed that the reason he fell out of his chair was because his shoe was untied. The only major damage to the pratfall was a crushed can of Diet Mountain Dew.